“To what extent is human activity responsible for that speeding up?” Carlson asked. This time, he got a response – sort of. The entire discussion went on like this for almost ten minutes, with Carlson consistently struggling to get a straightforward answer out of Bill Nye. 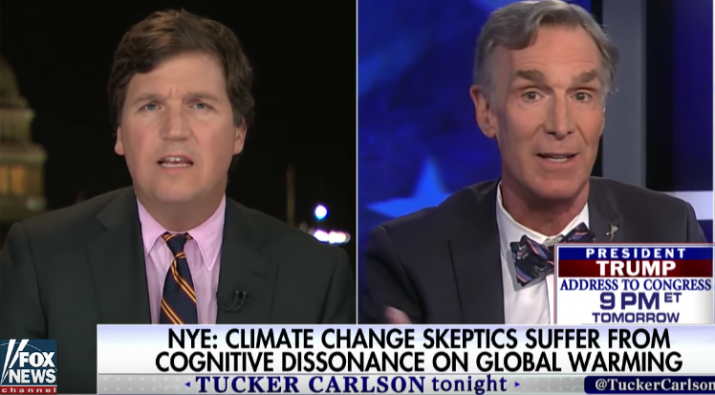 By the end, Carlson had accused Nye of “using the science of politics” and being a “popularizer,” not a scientist. In what appeared to be a final outburst of anger and frustration, Nye ended the debate by blaming Donald Trump for the recent leaks coming out of the federal government, a comment that had absolutely nothing to do with the issue of climate change. Bill Nye has certainly created a name for himself over the years and there’s no doubt that he’s been extremely successful – for that, Nye should be congratulated. What is disappointing, though, is that facts don’t seem to matter to him as much as publicity. On the surface, this is not made immediately obvious, but much like other liberals and environmentalists, when they are confronted with the truth or even basic questions, their true identities are revealed.